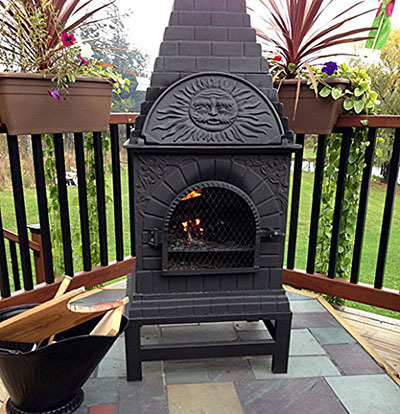 Whether you are looking for a chiminea to act as an accent piece in your garden or a functional fire feature on the patio, The Blue Rooster Co. is a great brand to choose for two simple reasons – beauty and excellent functionality. All Blue Rooster chimineas feature gorgeous vintage looks and a quality build that are easy to light, efficient, and clean burning. Since Blue Rooster chimineas easily accommodate manufactured fire logs, they produce some of the best fires you will find in outdoor fireplaces. We’ve tested and researched the following Blue Rooster chimineas so you can see why they are considered the market’s superior products and find the right one for your backyard patio. We’ve put together the below table so you can quickly compare our top choices side by side. Alternatively, can click here to skip straight to our number one choice. Do a good number of your summer evenings entail hanging outside with family and friends or having a fun cookout with guests? If so, the Blue Rooster Casita style chiminea is the product for you. Large sized, this chiminea not only produces tons of heat but also doubles up as an outdoor cooking tool, complete with grilling and baking grates forged from cast iron. In addition to staying warm, you will also be able to cook everything from stakes, to burgers, and even pizzas with the Blue Rooster Casita style chiminea. The unique design of this fireplace is another aspect we have come to love. It is built in the shape of a ‘casita’ (meaning cottage in Spanish). The base stand is steel but cast iron was used for the middle section along with a steel doorframe and mesh. On the upper roof-like area made with cast iron, a cute semi-circle sunburst door opens up the cooking area. We found this model to be the best Blue Rooster chiminea for those who want a fireplace that doubles up as a small barbecue grill. It features a cool rustic look, puts out more than enough heat, and cooks in minutes. However, there are a few tricks to using the product. To begin with, you will need to let the fire die down before you start cooking. Otherwise, food will come out burnt. It is also advisable to use a pizza stone or cast aluminum pan when cooking and protective gloves before touching the chiminea to avoid accidental burns. Lastly, the cast iron build of the chiminea requires regular paint touch ups to maintain its good looks. Beautiful, functional, and versatile, the Blue Rooster Dragonfly style cast aluminum chiminea takes second place in our list of the top 3 best Blue Rooster chiminea reviews, and with good reason. 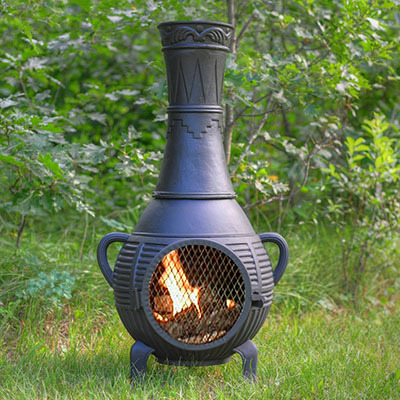 Its design combines the traditional potbelly look with an elegant aluminum cast iron body finished with dragonfly and fern leave etchings to create an eye-catching chiminea that will make the perfect centerpiece for any outdoor area. 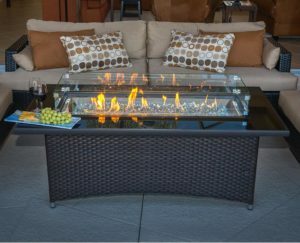 A huge mouth opening provides clear view of the fire thereby creating the perfect ambiance for a nighttime gathering. This chiminea comes with several handy extras that provide a great user experience. Included is a lid for protecting against the rain. You also get an insert for grilling and a cast iron grate for supporting the fire. The hinged door that makes it easy to add wood as well as roast marshmallows is an added plus. The paint chips off easily, but you can reapply. The Blue Rooster Dragonfly style aluminum cast chiminea is a product that will give you good value for your money. Due to its cast aluminum build, the chiminea is resistant to rust and can handle everyday use as well as exposure to weather elements extremely well. As a result, this beautifully designed chiminea will provide you with years of use. Our third pick, the Pine style Blue Rooster wood burning chiminea, is a lot like the Blue Rooster Dragonfly cast aluminum wood burning chiminea. It features the same narrow neck, potbelly bottom, and side handles design. Even the aluminum cast material, huge mouth opening and hinged door are the same as its Dragonfly counterpart. What’s more, the same extras such as a removable rain lid, grill insert, and cast iron grate come with this model as well. Differences between the Dragonfly style and Pine style Blue Rooster chimineas lie in the build of the products. 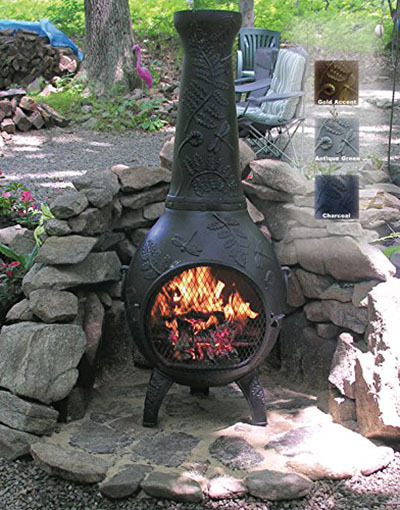 Unlike its Dragonfly cousin, the Blue Rooster Pine style cast aluminum chiminea has a much simpler design, which features less fancy etchings. 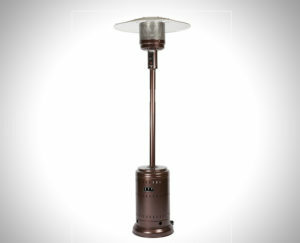 It is also much smaller and stands 8” shorter, 2” narrower, and 15 pounds lighter than the Dragonfly style chiminea. This small build is what gives the Blue Rooster Pine style chiminea its distinct advantage of portability. Simply put the Pine style chiminea is easy to transport and therefore the perfect option for avid campers. As is the norm with most Blue Rooster chimineas, this Pine style chiminea functions as both an outdoor fireplace and cooking tool. However, it goes a step further to offer portability as an additional benefit. Consequently, this unit allows you the pleasure of enjoying an evening fire and cooking dinner either in the comfort of your backyard or at the campsite. When looking for the best in chiminea technology, you can never go wrong with Blue Rooster. In fact, we simply cannot rave enough about their chiminea designs, which are so unique and beautiful to the point of being imitated by other brands. However, the quality construction of Blue Rooster is not something that can be matched or duplicated. With help from our list of the best Blue Rooster Chiminea reviews, you can narrow down your options and start to compare features and prices of their top offerings. If your looking for a few additional options before making a final choice, check out some of our other chiminea review articles.